A spectacular chalk-cut figure that is best seen from the air, but failing the availability of a helicopter can be viewed from the A352 just north of the quaint village of Cerne Abbas, or can also be reached on foot. Carved into a westward facing hillside the giant stands a massive 55 metres high while his right hand wields a huge 36 metre knobbed club, it could be that he once held something in his left hand too but whatever this was has now been lost. A short distance away to the east (to the top right of the giant's head) there is a small banked and ditched enclosure which is thought to date to the Iron Age - this is known as the Trendle or Frying Pan and is where dances were once held on Mayday. 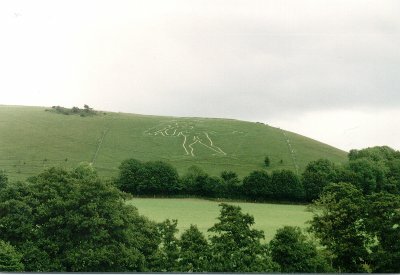 The Cerne Giant is much more detailed than the Long Man of Wilmington in Sussex, the only other remaining British chalk-cut human figure, which although taller, exists only in a basic outline form. 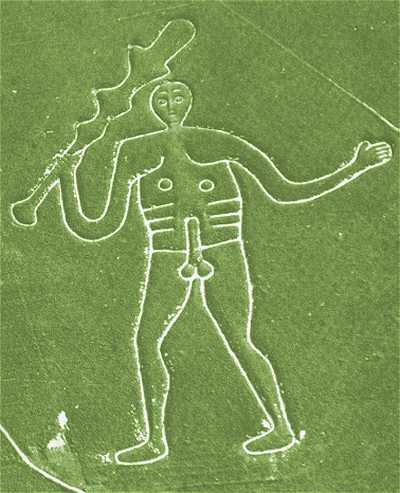 The Cerne man comes complete with face, fingers, chest and ribs as well as a full set of genitalia. It is believed that he could represent Hercules, or even an older Romano-British deity, although legend states that he was a real Danish giant who terrorised the locals of the area, and ate a number of sheep in Blackmoor. He then lay down on the hillside to sleep whereupon some brave peasants beheaded him and cut around the outline of his body as a warning to other giants. It is also said by others that the giant sometimes comes to life and goes down to the stream at the foot of the hill to drink, or even occasionally to eat a village maiden. The figure is surely linked to some kind of fertility cult, and it is traditionally believed that if a young girl slept on the figure she would go on to have many children and that couples who wished to conceive should spend the night on the hill. It is also possible that the giant represents a tribal totem, designed to ward off any potential invaders of the area by demonstrating the local tribe's strength and virility - a sort of prehistoric equivalent of 'man with big stick and pit-bull terrier'. Like the Uffington White Horse the figure is scoured every 7 years. Update: Recent investigations suggest that the giant only dates from the 17th century - it is certainly not mentioned in any writings before 1694 and it is further suggested that it is meant as an offensive parody of Oliver Cromwell created by Denzil Holles, a Parliamentarian who later became violently opposed to Cromwell. BBC video of the re-chalking of the Cerne Giant.